New Delhi: Speculation about the imminent demise of single-screen cinemas in India appears to be a bit exaggerated. The contribution of such theatres, usually located in small towns, to Bollywoodâs fortunes seems to be under-recognized, if box office collections of this year are anything to go by. 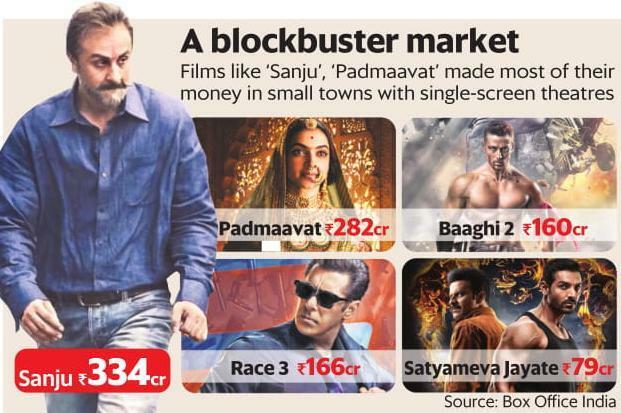 Trade experts say nearly 40-45% of the lifetime box office collections of blockbusters such as Sanju (review), Race 3 (review) and Stree (review), among others this year, have come from non-multiplex zones in the country. In case of a mass-oriented action drama such as John Abrahamâs Satyameva Jayate, 70% of the total box office collection has come from single screens. The massive success of these commercial entertainers can be traced to single screens in states such as Madhya Pradesh, Uttar Pradesh, Chhattisgarh, Odisha, Bihar and parts of Rajasthan. Leading production houses have obsessed with the performance of their films in multiplexes even as single-screen cinemas have shut down, one after another, starved of films that appeal to their audiences. To be sure, this yearâs collection is much higher than the past few years. Single screens usually contribute about 25-30% of a filmâs box office revenue, especially in north India. According to the Ficci-EY Media & Entertainment Industry Report 2018, the number of single screens in India shrank from 9,710 in 2009 to 6,780 in 2017. But, clearly, that hasnât diluted their potential to generate revenue if the content is worth it. âTicket prices in these single screens in small towns are low, leading to higher footfall,â explained Atul Mohan, editor of trade magazine Complete Cinema. A 550-seater is the smallest single screen auditorium youâd find in a small town; an 800-1,000-seater is quite common and ticket rates for these range from â¹50-â¹70. A commercial entertainer with mass appeal can register 80-85% occupancy throughout its first week in such properties. But a lot of the filmâs success has to do with content. As Bollywood increasingly embraces bold themes and unconventional storytelling techniques intended to cater to city audiences, there is little left for those who donât fall in that category. But films like Sanju and Race 3 are mainstream potboilers with generous doses of action, emotion and drama that arenât tough to empathize with or understand, and appeal easily to audiences irrespective of demography or geography. âA single-screen audience is looking for massy and not classy elements. They need action, songs and heroic dialogue,â said Hetal Patel, owner of Mahalaxmi Cinemas in Nashik. Patelâs biggest hits in recent times have been Baahubali 2: The Conclusion (review) and Marathi drama Sairat. Gargâs 619-seater saw fabulous business with Padmaavat (review), Satyameva Jayate, Baaghi 2 (review), Race 3, Sanju, Raid (review) and Raazi (review) this year, registering an average of 40-45% occupancy compared to the 25-30% he sees for niche offerings. Heâs now looking forward to the release of Yash Raj Filmsâs action-adventure Thugs of Hindostan for Diwali. His ticket rates range from â¹50-100. Mohan pointed out that unlike metros, where most of the footfall comes post evening when people are done with work for the day, if the content appeals to a small-town audience, they turn up for the shows throughout the day. âWe lack content that would be liked by the common man. The only people who usually come up with such films are Salman Khan or Aamir Khan or Aj ay Devgn. That is once in three months or on festive occasions,â Garg said. To be sure, the unusually impressive performance of single screens in small towns this year points to their potential, if given a chance. There are many challenges, as of now. To acquire a film from a producer, the theatre has to agree to a minimum guarantee payment of between â¹8-10 lakh, which it may find tough to recover if the film targets the multiplex audience. Unlike multiplexes, it doesnât have the muscle to negotiate revenue-sharing arrangements with producers. The implementation of goods and services tax (GST) hasnât helped either, nor have the additional local body taxes like those imposed in Madhya Pradesh. âOf course, they all want to be part of the big movie celebration. Something has to be done for their survival,â Mohan said.